The most recent copy of A Vengeful Longing is also available in mass market paperback. Crime and historical fiction. Three murders, two detectives and one very interesting “loan”. 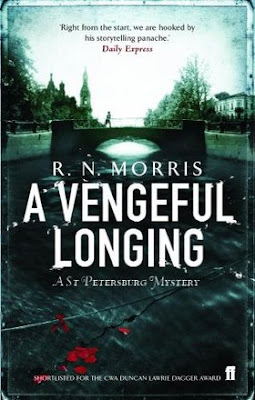 ‘A Vengeful Longing’ is the second book for which R. N. Morris has borrowed Dostoevsky’s character from Crime and Punishment, Porfiry Petrovich, and fully fleshed him out into the protagonist of this historical crime series. The St. Petersburg of 1868 was a generation post Napoleonic wars and pre-revolutionary Russia. It was an era in which the Tsar and nobility resided in country dachas far removed from the cholera and poverty stricken city of workers. ‘A Vengeful Longing’ also includes characters from the newly developing and educated middle class, a doctor, a trainee lawyer, but R. N. Morris is equally adept at describing the desperation and deprivation of the poor. This spread of characters not only gives a more truthful backdrop to the plot, but is one of Roger’s greatest strengths - his emphasis and skill at creating characters, vividly bringing them to life, or taking them from it, with equally graphic power. The greatest challenge I had reading it was one, which Roger is familiar with, “those pesky Russian names”. I was only able to read this book in many short sessions, and as a result, kept losing track of who was who, since Russian names are typically in three parts, and use the last name, the diminutive, or the full name depending on who is talking, how well the person is known and so on. This accuracy and authentic use of names is of course in keeping with the time and setting, although occasionally I did wish he’d just kept it simple, and foregone the accuracy. Having said that, his use of historical places and detail is not overly done. On the contrary, he manages to achieve the fine balance of giving a real “feel” for the place and time, without bogging down the story in background detail. We know St. Petersburg is on the coast, when seagulls call out above the correctly named Russian streets. St.Isaacs’ Cathedral features, but does not interfere with the storyline. This was spot on. I love crime (in the literary sense), and at the risk of a run-in with all his crime fans, I think the whodunit and whytheydunnit factors, are well done, but not brilliant. We are very aware from early on, as is the leading investigator Porfiry Petrovich, that the wrong men are arrested and released; and we are uncertain and unconvinced of the motives of the killer. As we reach the conclusion, we follow Petrovich’s psychological consideration of individuals, share in his chain of thoughts and the events that surround them, which leads him to the correct conclusions. However, just as the investigator is rational and steady in his approach, so is the plot, and for me there failed to be sufficient pace change at the end, which I would often expect of a crime novel. The dénouement happens quickly, and although we see it coming, it happens without a progressive build up. Now it may well be that different readers would react to this differently, but I would have liked to have seen more of the “thrilling and dangerous chase… as he hunts down a ruthless and elusive killer” from the blurb. Instead, it was a carefully measured pace which came to an almost unexpectedly abrupt conclusion. So if this was not what I most enjoyed and appreciated, what was there that held me in ‘A Vengeful Longing’, which made me think, which kept me wanting to turn the pages, which makes it a good book? For me, it is a crime story written in a literary fiction style. And not because the character is ‘borrowed’ from Dostoevsky. Because, by all accounts, PP is much more in R. N. Morris’s work than he was in the "original". For me, it is a literary fiction, because it is interwoven with themes, motifs and issues, which go far beyond your average murder mystery. From the opening sequence we are met with characters with various degrees of rationality and intellect, of mental or physical illness, of ability or inability. There is a fine balance between the mentally ill and the genius, and parallels between physical illness in the city and the sickliness of the State. There are ongoing hints of the political backdrop against which the action takes place, and in the final pages of the book, there is a strong hint of the revolution to come in the uprising of the masses against an unjust power. The idea of identity, national and individual also runs through the narrative and emphasises the author’s belief in the importance of character. “Is there, do you think a specifically Russian type of hypocrite?” asks Porfiry, at one point. And the belief in God or organised religion is also raised by characters questioning their own beliefs. Porfiry seems solid and astute, but also curious and humorously cynical. Porfiry’s enlightenment and insightful nature is contrasted well against that of the rougher policeman, Salytov. We see the psychological versus the brute strength approach and which wins over connects again into the political theme. Youth, growing old, and dying are also motifs which tie into the political and social aspects of the age but support the plot very well. We see young wives or mistresses replacing the old such as Virginsky’s new mother, and later the dying old mother whom is rather ghastly to hear and worse to see, appears to reflect the dying “old” Mother Russia which will give way to a new Russia, but not whilst the current situation exists. The family in which the daughters all die of cholera highlights that this situation has no future. Perhaps the strongest motif is the contaminated water system. We experience through Porfiry both the smell and health problems caused by the poor sanitation of the city canal and river systems, and the resulting flies and cholera. Porfiry Petrovich complains to the authorities about the canal below his office, and receives a letter which plays a part in the plot, but also highlights the disinterested unwillingness of the State to act. The motif also highlights the coexistence between the rational and the insane, physical and mental health. “The train stopped at a station on the Ligovsky Canal. The lunatic asylum remained in view, as if to provoke them.” Thomas Mann’s “Death in Venice” came back to haunt me reading A Vengeful Longing, in more than this motif. The role of women in nineteenth century Russia is not discussed, but is shown in the roles assigned to them in R. N. Morris’s fiction: prostitutes, mistresses, kitchen and serving staff, unwanted wives, presumptuous daughters or young women making unwise choices, even older women in authority are corrupt or too tied to the law to be good, the brothel manageress or landlady. I can’t think of one woman who is portrayed in a positive light. “I will not be writing any memoirs.” He replies. There are diaries, letters, political pamphlets and books read in secret which all have negative results upon sharing them. Porfiry achieves nothing through his letters and success through his thinking. This book demonstrates a fine choice of words, a carefully contrived plot and even better characters. The setting is vividly painted in a realist darkness which draws you in as a reader and keeps you in its murky depths until Porfiry Petrovich enlightens us all by solving the crime. Roger is a crime writer, but above all, this book shows he is a good writer. In a recent article in The Guardian, Michael Holroyd told of a meeting towards the end of last year of writers and Waterstone's staff at the Piccadilly branch, organised by the Society of Authors. “Deborah Moggach asked a question or two and learned that literary fiction was not on the whole welcome in the shop. In fact, the word "literary" is death to sales.” He wrote. So perhaps I shouldn’t say that this is literary crime. Is there such a thing? Perhaps it is just crime with an above average writing quality? For anyone who enjoys a good crime story, excellent writing and an enjoyable read, A Vengeful Longing has much to offer. Morris’s first Porfiry adventure, The Gentle Axe, was so successful that the publisher has authorized two sequels. This is the second, A Vengeful Longing, and he’s completed the third, A Razor Wrapped in Silk. I’ll be adding the two others to my reading stack, and I’m even inspired to read Crime and Punishment. I’m sure Dostoevsky would be delighted.